In any datasets each attribute has its own range. For instance an age attribute can have a maximum range up several hundred. On the contrary, monthly salary attribute will always have range in thousands. 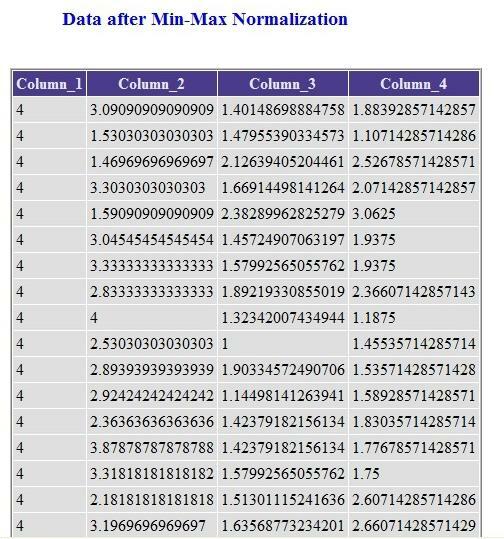 Abnormal minimum and maximum values (noise) can also lead to misinterpretation of data. 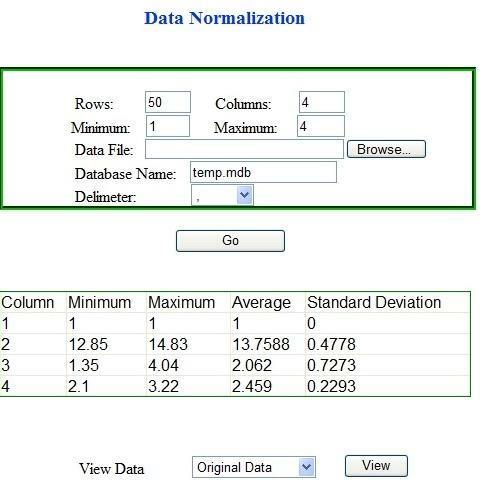 Data Normalization uses different techniques to narrow down values to a certain range. Min-Max and z-Score are most common normalization techniques. In this tutorial we will use ASP.NET to solve the data normalization problem. A web-based application will a read dataset, normalize it, and store it in a Microsoft Access database. 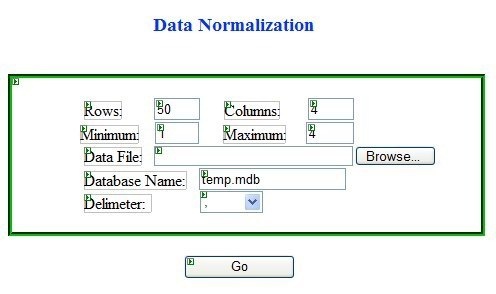 The normalized dataset will be displayed to the user in an ASP.NET data grid control. One Button control for starting the execution of code. // save each value to our original matrix "OrigMatrix"
For file parsing in ASP.NET, we used StreamReader class object. To use the class you first have to include System.IO namespace at the top of Default.aspx.cs file. OrigMatrix is a 2-D matrix for storing the parsed data. Size of matrix will be specified by user in the rows and column text area. Convert.ToDouble() function is for string to double conversion. At the end of this function all our required data will be stored in OrigMatrix. After doing the calculation we want the ASP.NET application to save values to a MS Access database. First of we have to create an Access database having five attributes, namely Column_1, Column_2, Column_3, Column_4 and Type. Data type of the "Type" attribute is Text, whereas rest attributes are of type Double Number. Name the table NormalizedData (you can also give any other name). Save the database file in C:\Inetpub\wwwroot. If you have installed Windows on some other drive than change the path accordingly. You can also place the above code inside a function so that it can be reused when required. Min, Max, Sum and Avg are variables of double type and i and j are integer loop counters. MinArray, MaxArray[j], StdArray[j] are our arrays of double type for for saving minimum, maximum and standard deviation of each column. ReturnMinMax and ReturnZScore are our own function. They take value and column no as parameter and return the results. In ASP.NET, easiest way to display contents of a database is by using a Data Grid. First we need to create a separate web form. Go to File menu and select New>File option. Specify name and language (Visual C#). Place a GridView control (present in the Data section) from the Toolbox. In our previous form we will place some useful values in the Session object. Place a DropDownList in the default form. While in the aspx file, select the DropDownList. A small arrow will apperar at its top right corner. Clicking the arrow reveals a menu for DropDownList Tasks. Select the link named "Edit Items...". Add items to the DropDownList by clicking the Add button and specifying Text and Value attributes for each item. Above code can be used for all three type of data namely original, min-max and z-score. Depending upon the "type" stored in the session. Don't forget to include t System.Data.OleDb namespace at top of the file. In ASP.NET data adapter object "da" acts like a bridge. It establishes connection between our DataSet object "ds" and the MS Access database "temp.mdb". Data adapter can not only read records from a database, but it can also delete records, edit records and store new records. ASP .NET DataSet object "ds" is a disconnected array. It acts like a cache. 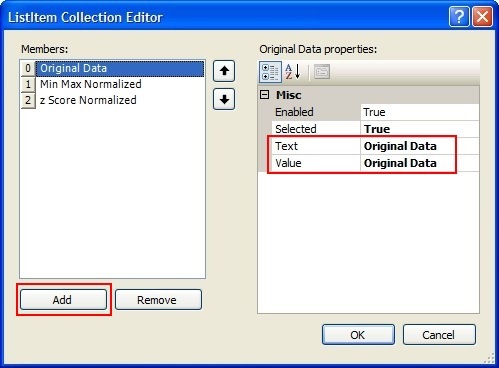 When you fill dataset using the data adapter object, values are stored to the data set object. Later on these values can be retrieved without connecting to database again. We can also use a Table control to show the statistics in Default.aspx file. For this purpose we will have to use objects of TableRow and TableCell classes. Here is an example. // each row will have cells equal to "numcells"
Here is the final screen shot of application containg the newly created table. In your ASP.NET application you can also use CSS. This will make the application more user friendly. All you have to do is to write CSS code in the source view of your .aspx file. Alternatively you can also use the attribute "CssClass" available in properties of each ASP .NET control.